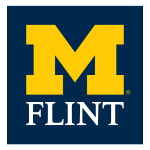 Many updates and changes are taking place with the release of the new University of Michigan-Flint logo, colors, and typography. One major change is with the registered university mark. The University marks are registered with the United States Patent and Trademark Office. Previous logo guidelines required the circle R (®) designation (some people are now calling “the R-ball”) at all times. As of March 28, the R-ball will only be required on sales merchandise, all other platforms and usage will not require this distinction. Meaning, if you are not placing the logo on an item to eventually sell, then the R-ball is not needed. The below images show how the logo looks with and without the registered mark. Only required on sales merchandise.